I really don't like days like this. The thought of taking my happy, smiling princess to the hospital to have her GJ tube changed is heart wrenching for me! I spent last night tossing and turning. I slept horribly and got up this morning feeling like my stomach was inside out. It seems like something that should be so simple. Let me let you in on something...nothing is simple when it comes to Makenzie. We went into the hospital this morning and checked in. The nurse came and got us and took vitals and weight. I love when they do this because Makenzie pulse oxes at 99-100. She has such strong lungs! It looks like she did loose a little bit of weight since the last time she was weighed so I guess we will have to up her calories again! My growing princess! I had a chance to have a long talk with the anesthesiologist and we came up with a plan. Then I talked to her Rehab doctor and decided to go with the requests of the ABM center to hold off on the phenol injections for now. Next the best part of my day happened.... Makenzie's rehab doctor looked at Makenzie and told me that she looked so much better! She was more animated, more interactive, she had so much more personality. She also agree that the tone... especially in her arms looked better which makes since because she is using them so much more! I totally love and trust this doctor. She is always very straight with me, respects me, and values all of the bio medical stuff I have done with Makenzie. With that said, her observations mean a ton! Thanks Pam! So along with the good comes the bad. 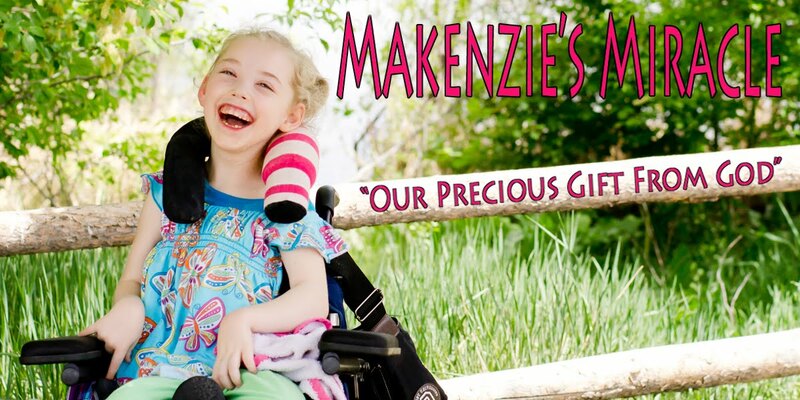 The good being that Makenzie is doing so well but along with that awareness and improvement comes the temper, the feeling of pain, fear, emotion, and the ability to let is be know to all that she is not happy! So today a simple procedure turned into a huge ordeal! Makenzie did not want ANYTHING to do with the mask with the sleepy juice. She screamed and then proceeded to puke, hold her breath, gag, and cough. After calming her down once we tried again with the same result. So then we went for an IV witch as you can imagine was not any more fun. They got the IV on the second try and with in seconds she was out! Right before she went to dream land she de-stated. At its worst her O2 levels were 79. This was for just a second or two and then they got the mask on her with the oxygen and she was back up at 100! Whew! Talk about a VERY nervous mommy! I am glad they know what they are doing!!! They got the tube changed and I was reunited with my sleeping princess. They did change the type of drug they gave her and she woke up beautifully! I curled up with her in the crib for about 15 min before she opened her eyes and with-in 5 min after opening her eyes she was on my lap smiling and babbling! Yeah God! Thanks for the prayers! They worked! Next time we will have to add prayers for the going to sleep processes too! Even though we were both traumatized it was the best GJ tube change ever. We had 2 GREAT nurses that didn't leave Makenzie's side. The anesthesiologist took time both before and after the procedure to talk to me in length. I got good news from my favorite doctor, and Makenzie woke up happy!! I have no clue how these people work with concerned parents everyday but today they did a stand up job! Anesthesia also makes Makenzie nauseous so I am giving her half strength formula and an anti nausea medicine. Please pray that she sleep well and doesn't have any problems with handling her food!! I am exhausted but oh so blessed! Today is done and God protected Makenzie and brought us to the end of a rough day! No more days like this for 3-6 months! Whew! Keep praying! Believe... Payer Works!